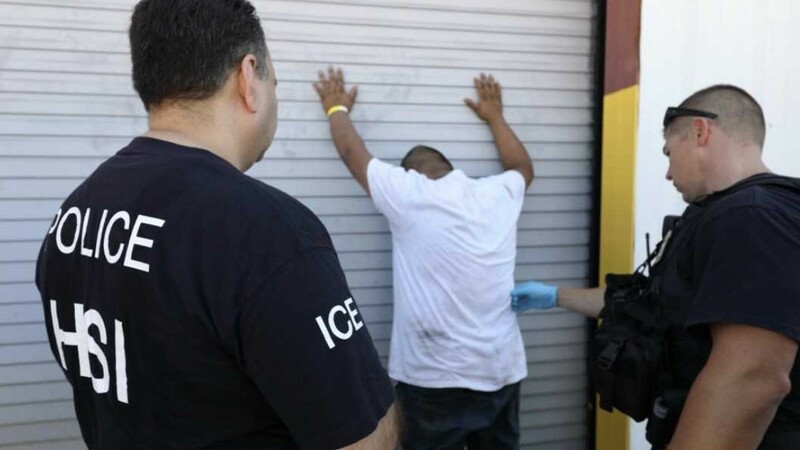 More than 300 federal agents raided a North Texas trailer-manufacturer on Tuesday that is accused hiring 160 undocumented workers despite being aware that they’re illegals. U.S. Immigration and Customs Enforcement (ICE) agents surprised the company with a criminal search warrant just before lunch at Load Trail located between Bonham and Paris, around two hours northeast of Dallas. It was a massive operation with agents coming all over from New Orleans, Houston and San Antonio. Some arrived in land-based vehicles, others even employed helicopters to bring them to Load Trail Trailer’s 100-acre facility in Sumner, Texas. Katrina Berger, Homeland Security Special-Agent-in-Charge of Investigations said the agents detained 160 undocumented workers as part of their larger probe, although they did not make any criminal arrests. Berger said Load Trail Trailers is regarded as one of the “fastest growing trailer brands." The company builds trailers for pick-ups, not 18-wheelers. A company insider said it’s nothing but “greed” that motivated Load Trail to hire illegals. Business was doing so that they had a backlog of orders which required additional workers. The company started as a family-owned business in 1996 has grown, now employing more than 500 people. The shop also includes more than 420,000 square feet of facilities. It even gained the award for the “Fastest Growing Trailer Brand of the Year” in 2014 and 2015. Former employees say the company makes from 75 to 100 trailers each day and has grown to earnings of more than $120 million annually. It’s the second time in only four years that Load Trail Trailers has faced federal immigration investigation. In 2014, Load Trail paid a $444,993 fine for “knowingly hiring and continuing to employ unauthorized workers.” Federal reports also said the company employed 179 unauthorized workers at that time. The undocumented workers from Load Trail are not off the hook yet as criminal arrests could still happen in the coming weeks as the probe progresses. I am very thankful for our good Law Enforcement - God bless them!! Build the wall and strengthen & enforce our immigration laws! Think about how much in FICA (SS Taxes) alone were not paid into the system. If the figures of 11 to 12 Million Illegals is close, that is the number of jobs that AMERICAN CITIZENS could have held. Imagine 1/2 that number removed for the Welfare roles. Imagine the reduction in Income taxes if the just the ILLEGAL Issue is resolved. For those Liberals wanting Open Borders I ask …. How much in hidden and related support taxes are you willing to pay? Just you, not anyone against Open Borders. We'll add a check box to the IRS FORM that allows you to added a extra 21% to your bottom line. We'll call it the IRS Put up or Shut-up Vote. If the total US Taxpayer cost of illegal immigration is the congressional estimate of $135 billion a year, and illegals paid only $19 billion a year in taxes (sales taxes) . That leaves a net cost to local, state and federal governments of about $116 billion a year. Lets say if only an estimated $110B per year is donated to support illegals is not collected 5 years straight, the borders stay guarded and the Liberal OB crowd shut the hell up. An we start deportation.